A mate of mine has started a new website, which is a pretty cool idea. It’s a central location where people can find and book photography workshops. Of course most of them are in amazing locations with amazing photographers. The site is www.fstoptours.com. This got me thinking about Photography workshops in general. I haven’t been on many photography workshops, but those that I have been on have been really good. Here are some of the obvious and some not so obvious things that I’ve gained from them. This one is kind of obvious, but will depend on the type of workshop you are going on. A travel workshop will generally involve maybe a day or more of classroom type training and then multiple days of hands-on experience. Others that I’ve been on have had about 30 minutes of classroom type training and then the rest was all practical. The way you prefer to learn will dictate which of these work best for you, but it’s worth looking at the itinerary of the workshop to see if there is enough, not enough, or too much classroom type training for the way you like to learn. To be blunt, I’ve found the educational side of some workshops not the best. Training or educating itself is a skill. I’ve been on some workshops with some amazing photographers who are not the best teachers. It’s hard to tell what someone is going to be like before you actually go on the workshop, but you can get a bit of a feel of things from checking out their website and if you can find any articles or video tutorials they have online that can give you an indication if their teaching style is going to suit you. It may also be that the photographer running the workshop is not the best in a classroom-type environment but is amazing at giving out tips and tricks once you all get out with cameras and are doing the practical stuff. The actual going out and taking photos is the reason most people go on a photography workshop. There are some basic skills that are the same that you’ll learn across all workshops, but there will also be very specific things you’ll learn depending on what kind of workshop it is. For example, when my wife and I did a workshop with Valerie Jardin a few years ago, one of the things I really wanted to learn was some techniques for how to approach people for street photography. I have always really liked “candid” street portraits. But I was very nervous about approaching complete strangers in the street and asking if could take their photo. Valerié was great at not just giving me some advice on how to approach strangers to take their pictures, but she also did a lot for just giving me the confidence to go out and do it. Most people learn best by doing, so it’s also great to get hands-on experience whatever the subject matter is. It’s like all those times that you’re out with your camera, you can’t quite work out how to do something and magically when you’re on a workshop, you’ve got an expert right there to talk you through what you need to do. Sure you could Google it, but there’s no substitute for actually having a living person right there that you can interact with. If you can afford to do a workshop in some far fly corner of the world, that’s great. But it doesn’t have to be that exotic. Doing a workshop in your own city can introduce to areas that you never knew existed or can even give you a whole new perspective on an area you’ve walked through a thousand times. There is also the advantage of being able to sleep in your own bed and not having to deal with jet lag. Although if there are other participants in the workshop from out of town I’d suggest seeing if you can find out before the workshop and maybe make a holiday out of it and stay at the same hotel, which also helps build a sense of camaraderie. I’ve also found those late night random conversations with the other participants some of the best learnings I’ve had from workshops so if you go home every night, you could miss out on those. This brings us onto the third and possibly best advantage that you get from going on a photography workshop. Just spending a few hours or a few days with like minded photographers is priceless. My wife and I have made lifelong friends from the workshops we have been on. It’s amazing to spend so much time with people who have the same passion as you, learning how to improve you skills and having loads of fun along the way. Something else that I’ve noticed when I go on a workshop, for about a week or two afterwards my photographic eye is IN. Because I have been so utterly immersed in the world of photography for 12-16 hours per day for multiple days my brain is totally in photo mode. So I notice angles, and light and patterns and shots that I may not notice when I am in my usual weekly grind. I guess there are not prizes for guessing my thoughts on workshops. Even if you think you know just about everything there is to know about the subject matter, I can assure you there is always new tricks you can learn and use. I find a lot of those to be super practical, since most of the time on a workshop is spent doing as the way that you learn, instead of being a classroom the whole time. Along with the learning, it’s the people and ideas that you come into contact to. Mostly everyone is there because they love the thing that you’re all learning about and doing, so everyone has the same passions and you have some amazing conversations and perspectives to see. Finally, if the workshop is combined with a stunning new or even old location it’s another helpful way to get yourself out of your comfort zone. I remember once I was chatting to two friends of mine, one a stills shooter and one a video guy. I and the video guy were talking about a new “lightweight” video tripod that had just come out and we were talking about how impressed we were that it only cost about $1500. At which point the stills shooter spat out his coffee and couldn’t believe that a tripod could cost so much. But for video tripods that is super cheap. Tripods are super important in the work that I do. I love shooting hand held or on the shoulder, but sometimes, a lot more lately, my setup is just too heavy to carry all day long. Also it helps sometimes to not have that “shackey cam” look. A video tripod is not like a camera that you buy a new one every 3-4 years, or for some of us even more frequently. Video tripods are a bit like lenses in that they are long-term investments. You may buy one and not need/buy a new one for the next 10 years. So what’s the difference between a stills tripod and a video tripod? They are heavier.This may seen obvious, but generally a video camera setup is going to be heavier than a stills setup and so you need a tripod that can hold more weight. With it needing to hold more weight, of course the tripod itself is going to end up being heavier. The other reason it needs to be heavier is that a stills tripod just has to hold the camera still and steady as you take a picture. With video, often, you’ll actually be moving the camera either for a side-to-side pan or a up-and-down tilt. The tripod has to be extra steady while you are moving the camera on it. Thirdly, the tripod needs to be sturdier because your tripod head is going to be a bit more complex for video. These days video heads are fluid heads which use fluids to give resistance when letting you move the camera smoothly. They cost more.Once again, the reason here is pretty obvious. Video tripods are more complex than stills tripods and need to be tougher. This kind of engineering costs more. They normally have a bowl that the head will fit into. This makes it really easy to quickly adjust the level of the head and get it straight on some pretty funky angles. So when it comes to tripods for my video work, I am looking for something that is super sturdy, yet not super heavy and easy to set up and pack up. That’s a big wishlist, I know. BUT enter the Sachtler Flowtech 75. This is a carbon fibre tripod that tries to rethink how tripods work. Let’s first talk about the standard features it has. It weighs a relatively light 3.5kg with feet and mid-level spreader but without the head. There are a load of different heads to choose from, more about this later. It can go as high as 153cm and as low as 26cm, which is a good range. It has three locking levels for the legs so you can get very close to the ground if you need to and you can do it pretty darn quickly. It can handle a payload of up to 20kgs, which is way more than what my back can handle, so we’re good there. A really cool little feature is that when you are storing the tripod it has magnets toward the bottom, so when you close the legs together they just “click” together and you don’t have to fiddle with plastic or materials to get the legs to stay together during transport. Speaking of transport, the tripod folds down to a height of 67.4cm without the head, which fits perfectly in my ThinkTank transport manager 30. It has rubber feet that sit on top of metal spikes. You can use the spikes in soil and such and the feet just about everywhere else. The feet are really easy to get on and off, which is another nicely thought out feature. I went with the Ace XLhead which only has a payload limit of 8kgs but since I really like my setups as light as possible I figured this would be ok. Also this was one of the lightest heads available coming in at 1.7kg. Initially, I wasn’t sure about it as it feels kinda cheap and plastic, but it has performed beautifully. It uses a standard Manfrotto 501 type plate, which is nice as surely most of us have a few of those lying around. The show-stopping feature though is how you can quickly deploy and adjust the height of the tripod. There is a red plastic “tab” on each leg and you simply flick it up and the leg just drops to the ground, or you just lift the tripod. So getting set up is as easy as three flicks, lift and then flick the tabs back down. This is an awesome feature for folks who often find themselves working on their own. 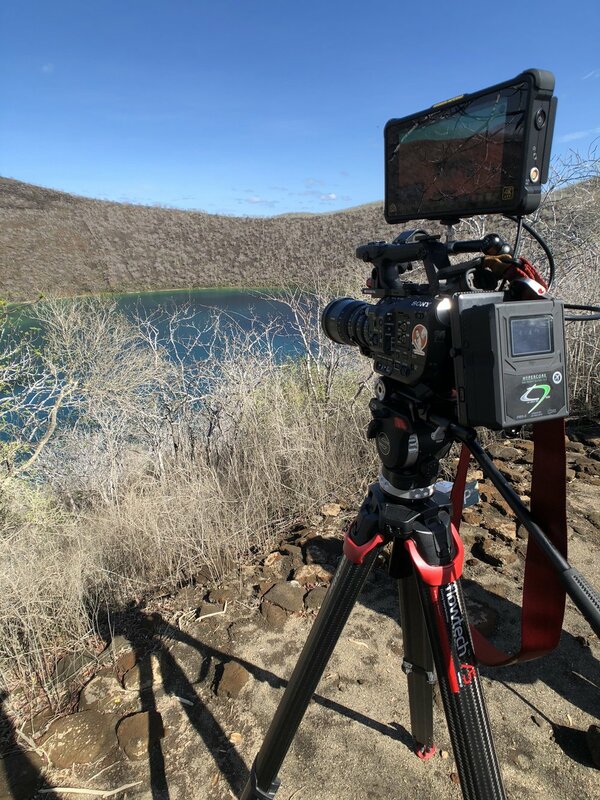 I recently got back from a shoot in the Galapagos Islands and one of the big challenges on this shoot was time. I was shooting footage for a medical conference and so while I was there to capture behind the scenes footage, I had to work around the schedule of the conference. So when the group had to move on, I had to be able to grab my camera, pop my tripod on my shoulder and move onto the next location. Then once I got to the next location I had to be able to set up as quickly as possible since I had limited time to shoot in each spot. Now I know about 4kg for a tripod seems heavy to schlep around an island along with a camera, but it’s actually about 2-3kgs lighter than my previous tripod, which made a huge difference. At $1282.50 USD for the legs alone without a head, I can see how this may seem expensive if you’re coming from a stills background. But for video folks, this is actually a really well-priced tripod. The only drawback for some shooters is that it doesn’t have a high enough payload that it can handle. This is not an issue for the way I shoot and I absolutely love the mechanism they’ve developed for deploying and adjusting the height. Compared to other tripods in this range, it is also one of the lightest around, which is a great feature. Not only do I really like this tripod, I think I can see a second one in my future. A review and quick look at the Camlink from Elgato which lets you use any HDMI camera/source on your computer. I've been using the Cobra2 for a few months now, really like it and just got the Cobra Strike. Here is a little about them and what I think of them.